I am a member of the engineering staff at the Lockheed Martin Advanced Technology Laboratories in Cherry Hill, NJ. I belong to the ACM and am webmaster and past ACM Chair of the Princeton joint ACM/IEEE-CS chapter. I am Secretary and webmaster of the David Sarnoff Radio Club, a life member of the ARRL, a member of the FISTS CW Club, and a member of the New Jersey QRP Club. I am Treasurer and webmaster of the Pinelands Orchid Society. I am not a vegetarian because I love animals. I am a vegetarian because I hate vegetables. The Pinelands Orchid Society home page. The joint Princeton ACM / IEEE Computer Society Professional Chapters home page. The David Sarnoff Radio Club home page. The New Jersey QRP Club home page. A description of the amateur radio 6-band HF coaxial-cable trap dipole antenna I constructed in my attic. A vegan and gluten-free peanut butter oatmeal cookie recipe I developed. Amateur radio log book sheets formatted for 8.5 x 11 inch paper with 3-hole punch. Portrait layout similar to the older ARRL spiral log book, 25 contacts per page. Landscape layout similar to the newer ARRL spiral log book, 20 contacts per page. Reference charts for 2-octave major and minor scales and arpeggios for piano. Talks I presented at the Trenton Computer Festival. A talk on the Y2K Problem I presented to several PC User Groups in New Jersey in 1999. Practicing and teaching Baptiste Power Vinyasa Yoga at Anjali Power Yoga. I studied under Johnna Smith and am an RYT 200. Amateur Radio operating CW and digital modes as Extra Class NU3E. Bicycle touring on a 1986 Cannondale SR400. Taking adult piano lessons and tuning and playing my Yamaha C2 grand. Pilates: mat, small apparatus, and reformer. Bike MS City to Shore charity ride, 175 miles, September 2008. 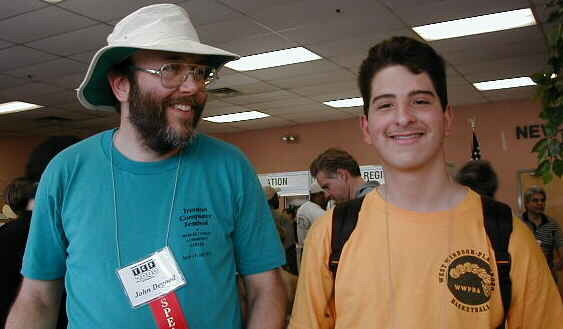 My older son Scott and I at the Trenton Computer Festival speaker registration table, May 2000. 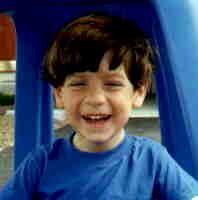 My younger son Eric at age 4 1/2.